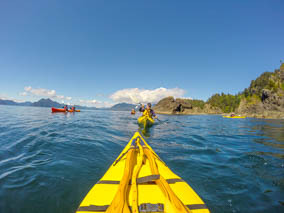 During the late 80's there was a sudden growth in the number of companies offering sea kayak tours on the coast of British Columbia. At the same time there was a serious deterioration in average level of experience of sea kayak guides. Many guides were talking about what was going to happen if there was an accident on a commercial trip and how the government would probably rush in with some heavy-handed regulations. There had been a couple of previous attempts by sea kayak guides to form some kind of self-regulating body but these had failed due to a combination of apathy and distrust. In December 1991, a chance meeting with Marty Rosen (a very experienced guide who had recently left Ecosummer) led to discussing the possibility of forming a grassroots organization. The idea was for all tour operators to be invited to develop a set of guidelines or a "code of conduct" rather than a more rigid system of certification. Membership would be based on adherence to the guidelines. In January 1992 Marty sent out a letter inviting people to a meeting in April '92 to discuss the possibility of forming some kind of guide's association. It was recognized that there could be some suspicion between different tour operators, so it was decided to hire a professional facilitator who had absolutely no connection to sea kayaking to run the meetings. There were five meetings held between April '92 and October '93, four of which were led by the facilitator. Participants at these meetings created the name "Alliance" to identify the group of people involved with the process. The meetings started out well with everyone agreeing that it was probably wise for guides to organize themselves before some outside agency was brought in to do it to us. However, the process started to bog down when we began to discuss specific guidelines e.g. guide/client ratios, level of first aid training, etc. The participants divided into two camps - those who advocated adopting the lowest common denominator (the status quo) and those who felt that the lowest common denominator was going to lead to disaster. Then, in July 1993 there was a fatality on a commercially led tour in the Queen Charlotte Islands (now known as Haida Gwaii). For details on this incident see the Transportation Safety Board Report or this PDF file. It seemed for a brief moment that there might now be some incentive to get moving with the guidelines. Instead, the process came to a standstill; the Alliance meeting in October '93 was pretty much a repeat of the previous meeting in April with people arguing over whether it was necessary to wear PFDs, whether advanced wilderness first aid training was necessary and how it was uneconomical to operate tours with less than a 1:15 guide/client ratio. The grassroots process had failed. 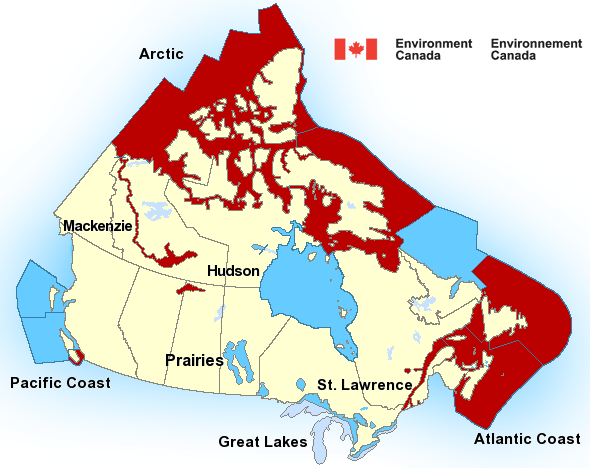 After this meeting, five of the original six guides who had founded the Alliance resigned and formed the Association of Canadian Sea Kayak Guides (ACSKG). They wrote a detailed and unambiguous set of standards to which members were required to adhere as well as a system by which guides would be certified. These standards were soon adopted by Parks Canada as baseline standards for Gwaii Haanas National Park Reserve. 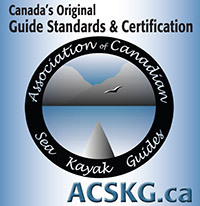 Unlike other sea kayak guides associations in BC, the ACSKG limits its voting privileges to qualified guides. This means that business owners who do not actually guide any tours are unable to shape the policy and standards of the ACSKG. Not surprisingly, the creation of the ACSKG ruffled more than a few feathers and resulted in a splitting of the guide/outfitter community. This fracturing of the guide community has caused some positive and negative results. On the positive side, it has forced people to show their true colours with regard to the issue of high standards for tour operators. While some people would try to argue that the issue is about "freedom" and "the right to do things differently," it doesn't take a rocket scientist to see that the real issue is profit. Lower standards equal higher profits - it costs a tour operator time and money to train guides and you have to pay them well if you want them to work more than one season. On the other hand, if the tour operator tells a buddy that they can come along on the tour for free if they act as the assistant-guide then there is a serious amount of money saved. The savings compound if the operator sends the same buddy back out next summer as the head guide. Today, outfitters on this coast are essentially divided into supporters of the ACSKG or the Alliance. The ACSKG recognizes the significant developments undergone by the Alliance over the last decade. Yet, there remain fundamental differences between the two organizations. Perhaps the single most significant difference involves guide/client ratios: ACSKG standards contain guide/client ratios endorsed by Parks Canada. Alliance standards contain ratios more profitable for outfitters, however Alliance guides must meet the higher ACSKG standards when guiding in Gwaii Haanas National Park Reserve. In conclusion, the ACSKG stands for safety, not profit. We are focussed on maintaining high industry standards. Any business that puts profits before ethics will have a negative impact on the industry and on the environment. It's true for logging companies and it's true for sea kayak companies.